Let’s first admit that most consumer electronics out there aren’t as pleasing to the eye as we would like them to be. (That’s why we all agree Apple’s products are groundbreaking—if at least for their impeccable industrial design.) Rarely, too, do we see tech products designed for the female taste. It’s not just splashing a coat of pink paint on an iPod or a mobile phone. But does it also mean slapping the Hello Kitty motif onto every nook and cranny of a laptop? I wouldn’t really say that, but what’s the harm in bringing this pop culture icon into the computer gadget industry? This cute cat already has, actually. Looking at three Hello Kitty themed laptops shouldn’t be so bad. Amidst all the cries of ecstasy over Mac OS X Leopard at the WWDC07, we have a little surpsrise: Safari is released for Windows. It’s a public beta, to be exact. That’s great news, coming not from someone who wants Apple to take over the world, but as a web designer who wants to test web pages in all kinds of browsers. I haven’t been able to do that on Safari since it’s always been released on the Mac exclusively. It’s also a great idea to discover a new browser every once in a while. Find out which one has features that best suit your taste. 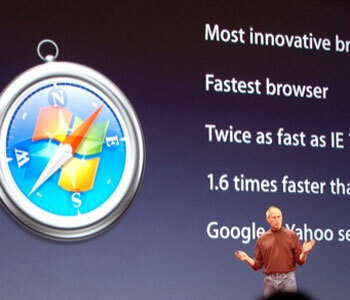 After all, Steve Jobs claims it’s twice as fast as Internet Explorer and 1.6 times as fast as Firefox. Problem is, right after downloading and installing Safari for Windows I ran into two major problems right away. Before Netscape.com turned into a social voting website (read: Digg clone), before Firefox graduated from the Mozilla Application Suite and became the darling of net geeks and casual surfers alike, before Internet Explorer emerged victorious from the First Browser War using the classic Microsoft tactic, and before people understood the value of a web browser, there was Netscape. It was actually called the Mosaic Netscape browser then, since the company started out as the Mosaic Communications Corporation. Netscape—both the company and the browser—has gone through ups and downs but today it stands tall, having released version 9 of the classic browser this June 5th. There were many interesting things to discover and enjoy at this year’s D conference, D5. One such example was Microsoft Surface. But surely the biggest highlight of the event was the interview with Bill Gates and Steve Jobs for the first time in twenty years. 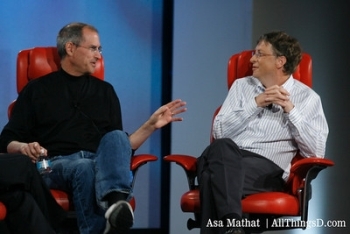 Before turning into the two icons representing the two biggest rivals in the computer industry, Bill and Steve were first and foremost pioneers and visionaries whose work catapulted them and their companies into great success. D5’s interview quickly reminds us to cease the hostilities if at least for one night, and simply be in awe of their presence. That’s not even half of it. Imagine dropping everything else for that occasion just to reminisce. Stories of how Bill and Steve worked together were essentially tributes to each other’s achievements—some even complementary to each other. Apple asked for Microsoft’s help in adding floating point support to the Apple II BASIC, which it lacked. Bill got paid $31,000. Soon Microsoft would create software for the Macintosh to penetrate the Lotus-dominated industry. The graphical user interface (GUI) would debut, Apple would survive the slump, Steve Jobs would return, and Windows 95 would become a hit. These days, the Microsoft Zune is going head to head against the Apple iPod, but there’s more. Bill confirms he used Macs to develop software for the Xbox 360 during its early years. “And we never ran an ad on that,” quips Steve. They go on to infer what computers will be like in five years. Which form factors work and which won’t? Bill still believes in his tablet PC despite its relatively low popularity, as well as several other screen sizes that won’t necessarily compete with one another: you still won’t want to edit your homework or edit a movie on the screen of that size. And so you’ll have something else that lets you do the reading and editing and those things. Steve brings up Google Maps on the iPhone as a great example of an application that works much better on a specialized client (rather than the broweser). Phones and iPods will become post-PC devices. The interview goes further to cover their thoughts on the Internet, entertainment, and even 3D. At this point Steve Jobs has kept mum about the Apple products that are still under wraps. I could go on and on and on, but this post won’t do the whole interview justice. You can read the full transcript and the live coverage notes, but do yourself a favor and watch the videos for the real experience. Teasers can be found here, as well as the rest of the clips. And that got a standing ovation. Well done, you two. Now you have the chance to not only read online books but you can rent textbooks or access any PDF file you download. We’ve all seen and heard about modding the look of computer peripherals and other present-day machines to fit a person’s personality or simply to follow certain whims (read: too much time on one’s hands). 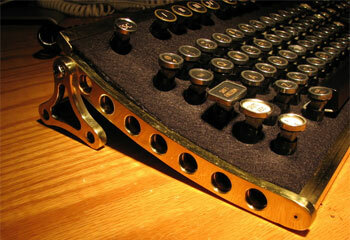 An interesting, shall we say, genre modders like to do is that of Steampunk. It’s a look based on the type of sci-fi/fantasy/speculative fiction literary genre, Steampunk, where steam is used to power high-tech inventions set in the Victorian era. I recently had the privilege of unboxing one of my most treasured possessions ever: an Adobe Creative Suite 3 Design Premium. It’s not a gadget, but it’s tangible, and costs more than any other thing I own (other than Risk, my laptop). What is unboxing? It’s one thing to pick out a tech toy and become its proud owner. But it’s a whole other matter to do the honors of unboxing it. Unboxing, as the word suggests, is the geeky ceremony of taking your beloved gadget, toy, or whatnot, out of its box, piece by piece. Enthusiasts who engage themselves in such an activity pay attention to the packaging and other accessories that come with the box. Also, they make sure they take several pictures or even a video of the whole process. The psychology behind unboxing. Unboxing isn’t exactly a groundbreaking or alien concept. But to bloggers, especially techie and gadget bloggers, it’s become addictive. Aside from basking in the fact that you’ve gotten your hands on a much-coveted item, I dare say that companies like Apple have done so well with packaging and product design that we’ve learned to appreciate their efforts through unboxing. And then of course there’s the very real possibility that we’ll never be able to own certain gadgets and have to be content with seeing others do the unboxing instead. Get your unboxing fix! There are several sites out there solely dedicated to unboxing gadgets. There’s even a site that shows the Apple iPhone being unboxed, yet it hasn’t even shipped yet. Here’s an even better idea: the next time you have your hands on a gadget (literally, it need not be your own! ), why not do an unboxing of your own? Pileus is an umbrella connected to the Internet to make walking in rainy days fun. Pileus has a large screen on the top surface, a built-in camera, a motion sensor, GPS, and a digital compass, and it provides two main functions; [sic] A Social Photo-sharing and A 3D Map Navigation. The “social photo-sharing” part is actually with Flickr, while the “3d map navigation” part is powered by Google Earth. Pileus started out as a research project by Sho Hashimoto and Takashi Matsumoto at Keio University’s Human Computer-Interaction (HCI) Design Lab. You can also catch a live demonstration of the Pileus prototype at the San Francisco Arts Commission Gallery from April 20 to June 16. 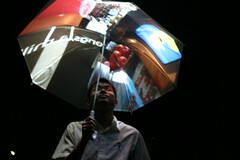 This quirky umbrella has also grabbed attention in Europe and South Africa. I would never stand under the rain and use my umbrella to surf the web. That aside, it looks like fun in a really geeky, Inspector Gadget slash James Bond way. It seems the most unlikely products want to be iPod-compatible. That’s how powerful the Apple iPod brand has become: it’s now a selling point for companies wanting a little boost in their sales. 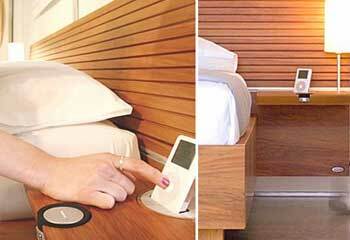 The Pause by Design Mobel is the world’s first bed that lets you play your iPod with it. They also call it the “world’s most comfortable iPod Dock”. See also: Lomme, another iPod-friendly bed with a futuristic feel. You and I may be gadget freaks, but we can’t own ’em all. What could we possibly do once we see or hear about a cool new tech toy we’d love to get our hands on but can’t (at the moment, at least)? Why, add it to our wishlist, of course! I believe it was Amazon that popularized the concept of a virtual wishlist. You’d find them on the sidebars of people’s personal websites even before blogging really caught on. But these lists were mostly made of book titles, not necessarily gadgets. Eventually wishlists have been incorporated as one of the neater features of online shops. But like Amazon’s, the wishlists do not work across multiple online shops. These days, you don’t really need to stick to the Amazon Wishlist format anymore. Wishlistr lets you add a website as an item on your wishlist. Or you can search for products you wish to add manually. Even better is that you can export the list as an RSS feed. Another site you can use as an online wishlist is StyleHive, since it’s filled with features that describe, tag, share, and discover products you’d want to have or already have, although the community is geared more towards the stylish rather than the techie crowd (not that they’re necessarily mutually exclusive, though). Similarly-structured wishlist management sites include Wists, WishRadar, Gifttagging, grat.uito.us, MetaWishlist, and GiftHat. view my wishlist, I can just type in del.icio.us/sofimi/wishlist. Finally, why not blog your wishlist? Your blog post does not have to be a literal list, but perhaps a product (or two) you’d like to add to your personal wishlist. You can always tag your post (if your blog supports tagging/labels) with “wishlist”, or you can create a whole new category revolving around your Wishlist! And if you have enough time, take things to the next level by opening a whole new blog so you can add items to your wishlist all year long!